This is such a simple dish but delicious, you can add more balsamic if you want it sharper and the pine nuts pretty much make the dish so add more if you like as well. To make the pasta place the flour in a food processor, beat in the eggs, beetroot juice and a teaspoon of olive oil, season with salt, remove and knead into a smooth ball. Rest for 30 minutes then roll out and cut into inch strips as per pappardelle. For the sauce juice peeled beetroots until you have around 500ml juice then add to a pan and reduce the beetroot juice down by half then add the balsamic vinegar. Cook the pasta in boiling water for 2 minutes then add 100ml or so of the sauce and cook until all the liquid is all absorbed from the pasta, finish with a small knob of butter. 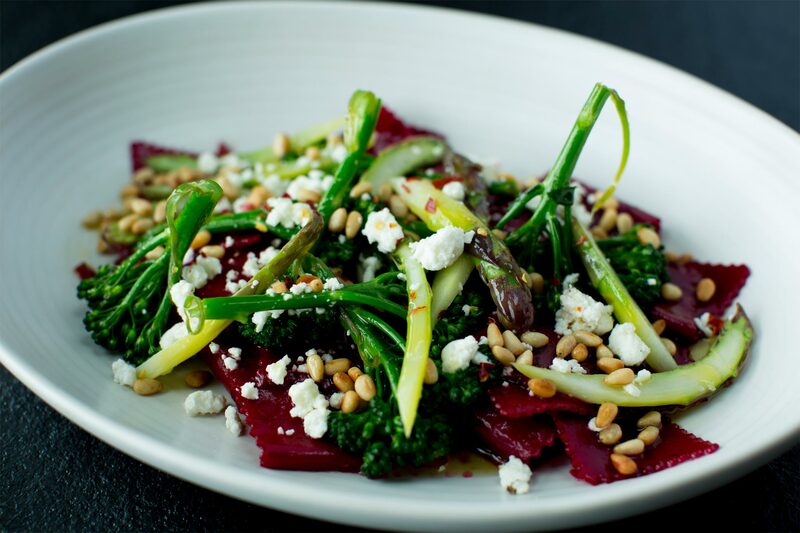 Place on a plate then top with the blanched asparagus and brocolini, then the crumbled goats cheese and almonds.